Lets talk anything and everything about Oral and Dental health !! Lets talk informally about all dental issues. A dentists explains from a common point of view. If we say in one line that a healthy mouth is the first step towards a healthy body than it would be correct in two senses. One is that everything we eat or drink to take care of our body’s nutritional requirement will go through mouth way and another important thing is that the infection from an unhealthy mouth can spread to other organs in body and can many folds increase the risk to other organs of the body as well. Hence the main focus should be on keeping the gateway to our body clean and healthy. Regular brushing is important to keep oral cavity clean but that usually takes care of the hard part that is teeth and gums are somehow neglected in due course. So if your teeth are free of caries/decay than that does not guarantee healthy gums. Gum Disease affects approximately 80% of the population. This may range from occasional bleeding during brushing to swollen gums with loose teeth. In most instances, patients are unaware of the fact that they have a gum infection that is destroying the bone and tissues that hold their teeth in the jaws. Gum disease is somewhat similar to high blood pressure which may also be asymptomatic but cause serious consequences if it remains undetected. 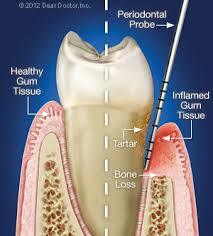 Gum disease can lead to loosening and premature loss of teeth in addition to bad breath, bleeding gums and sensitivity. And these are only some of the consequences of gum disease that are limited to the mouth. Disease of gums is an infection which is mainly bacterial and called as periodontal disease, of course smoking, alcohol and certain medications add to it. Oral cavity has a very rich blood supply, hence bacteria in the gums can enter the blood stream and travel to major organs. Recent research suggests that people with periodontal disease have an increased risk of developing heart disease, 4.3 times greater risk of stroke and seven fold increase in the risk of pregnant ladies delivering pre term, low birth weight babies as infection spreads to uterus. Special mention of diabetes is needed as if you are a diabetic, mouth infection can disrupt your blood sugar levels and make your diabetes harder to control. Neglecting your oral health lead to more than just sore teeth and bad breath. Hence, treating gum disease is not just about saving teeth but more about your overall health and well being. 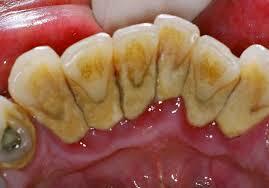 This infection in gums needs to be treated at the slightest onset to prevent its spread to other organs in body. Also, contact your dentist as soon as an oral health problem arises. Remember, taking care of your oral health is an investment in your overall health. This entry was posted in Uncategorized and tagged Gum Disease, oral health, periodontal disease. Bookmark the permalink. Answer to the big WHY ? SPECIALISATION IN DENTISTRY – ALL YOU WANT TO KNOW !! IS ROOT CANAL PAIN FULL? Dental Implants – Are they worth it ?